Elves and dragons have always been the fantasy of many gamers. Besides, there aren’t too many slasher games on Android where we can slice and dice enemies to our heart’s content. A fantasy world filled with dragons and mythical monsters, action-packed gameplay and a role-playing element; what more can an enthusiast possibly ask for. 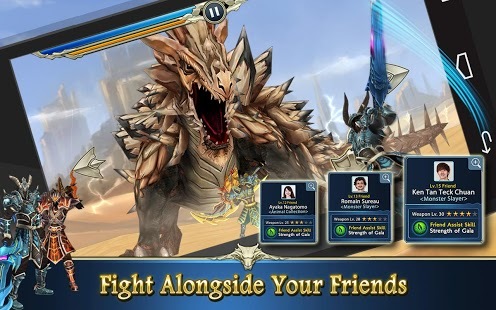 We have seen the prowess and performance of Capcom’s Monster Hunter and the iOS oriented Infinity Blade in the past. Monster Blade draws significant cues from these two games, so much that even the name sounds like an amalgamation. Graphics – The visuals of this game is undoubtedly a selling point, gorgeous and stunning! Role-Playing – We can customize the playable characters in this game. Equip and upgrade them with over 400 unique weapons and armors. Gameplay – The gameplay is extremely engaging, with powerful boosts and attacks. Characters can take the form of powerful monsters and use their special attack moves. Online gameplay – We can play a cooperative campaign and defeat powerful bosses by joining hands with online friends. We can also challenge other gamers in the leaderboard and win special awards. Collectibles – Apart from the role-playing element, the game offers plenty of collectible items such as weapons and armors, during the game. We can collect them and unlock secret and powerful abilities. The storyline is pretty basic though I must say, it hardly resembles with any other. The game begins with a duel between the protagonist and an evil dragon, who is also the final boss. After facing defeat, the player goes on a journey around the fantasy world, destroying lesser monsters and gaining power. Finally, there’s a rematch with the final dragon boss. Following the player in this journey is a cute little creature called Ocha, who is constantly pouring advice on tips and tricks. The RPG element is apparent during the course of events and picking up normal loot after a battle is just fine for developing the character. On the contrary, in Monster Hunter, one needs to go on separate missions to hunt for special items and drops. 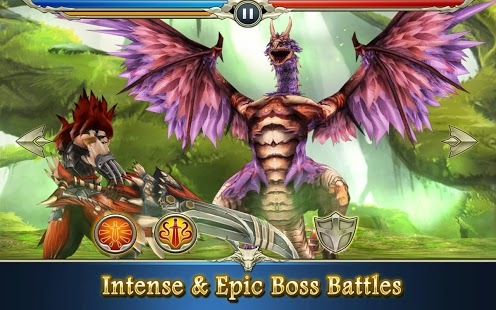 The interface during battle sequences resembles the likes of Infinity Blade. Players are required to swipe to swing their weapons and defend by blocking or rolling. There is a power bar that charges up over time and we can execute the same after that. There is a lot of fast-paced slashing and evading involved which makes the gameplay mojo fantastic. The free gear available in the game is enough to overcome all the obstacles. So far, the game isn’t totally lag-free. It has issues with frame rate which slows the gameplay at intense times. Though there is a bit of server time also, the game satisfies your hunger for action-adventure with much gusto. There’s nothing much to complain about as it is available free for download from the Google Play Store and will likely get fixed with a few patches from the developers over time.